What is the best firewood processor for your needs? The choice comes down to the scale of your operation, size of your logs and your productivity goals. There are tons of options in the market for efficient firewood processing. It’s easy to get lost in all the features, styles and sizes of processors when looking for just the right machine for your operation. Whether you are planning to make the jump from a splitter to a firewood processor or looking for a new firewood processor for commercial operations or for private use, make sure to consider at least these three key points. If you have a large operation... Look for a firewood processor that is equipped with professional features such as an automatic chain tensioner, large live decks with up to 20 ft of loading capacity and enough performance to split the hardest woods into high quality firewood. Consider operating different sized processors for even higher efficiency. If you have a small-to-mid-sized operation... Look for a processor with enough capacity to increase your production without breaking your budget. Always consider the resale value of the processor to leave room for upgrading to a larger model as your business grows. If your processor is for private or shared use... Look for a model with ease of use, fast set-up and small storage space. Remember to check the manual for built in safety features and maintenance requirements to avoid any problems with the machine in the long run. If you own a tractor, consider a portable firewood processor (PTO model) with a 3 point hitch connection instead of a petrol engine model. Make sure to choose an appropriately sized processor for your logs. Measure the average size of your logs and pick a model that is one or two sizes larger to accommodate most logs. If your average logs are 15” in diameter as an example, but some stumps or logs go over the limit, cut off the oversized stumps and split them with a manual log splitter. Large logs need to be split in 8, 12 or more pieces. Some processors offer larger cutting capacity but require re splitting of firewood which generates extra labor. Well-designed wedges and fast splitting cycles increase production capacity and minimize the need for additional handling of wood. Processing small logs with a large processor is inefficient and translates to low profits. Large operations should invest in various sized firewood processors and sort logs accordingly to increase productivity, profitability and to optimize production. After securing the source of your logs and lining up customers to match your planned investment, it is time to consider your operating costs. 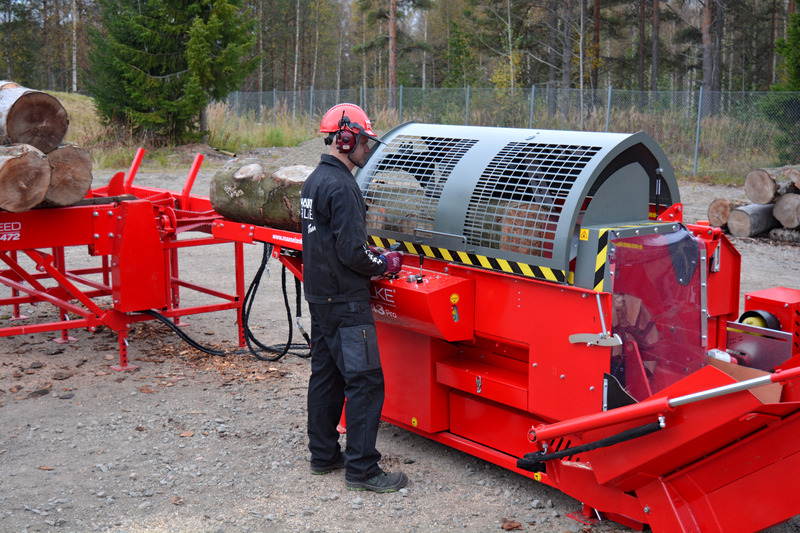 Firewood processors require a certain amount of maintenance depending on the design of the machine and serviceability. Advanced hydraulic designs make for efficiency and low fuel costs. Reliable electrically controlled systems are durable and require less maintenance and spare parts. Firewood processor productivity relies on efficient handling of logs, smooth material flow and user ergonomics. The larger the live deck loading space, the more time your personnel have for other tasks such as handling the finished firewood. Smooth infeeding and controlled log landing decrease the need for extra operator handling. Smart operating systems prevent unnecessary breaks and human errors that cause down time.